Remaining a top MBA school depends upon the fine caliber of its faculty and students  and rightfully so. But another equally important network of talented professionals plays a key supportive role: the Kellogg Schools excellent administrative staff, without which Kellogg would cease to function. Theyre the K Team, the legions of staffers who help students find jobs, assist an alum in need, and contribute in thousands of other ways to the running of the school. If Kellogg is known for its customer-service orientation, the schools administration gives life to that ideal. Meet the members of the K Team, and learn how they make Kellogg shine. Kelloggs Admissions Department faced an unusual challenge last fall  an additional 1,000 applications to read, analyze and judge in just eight weeks. Each applicant would need to be interviewed, as well. Yet the department completed 99.9 percent of that unprecedented workload by its first-round admissions deadline. How did the team surmount this challenge? With characteristic determination, dedication and planning. Position titles were set aside as each staff member did what was needed to get the job done. Sometimes that entailed answering telephones and opening envelopes; it also meant sacrificing evenings and weekends. Additional part-time staff  including some former Admissions Department members  helped the team meet its goals. They possess many of the same strengths you find in Kelloggs student body  theyre a talented group with diverse backgrounds and a willingness to work diligently toward a common goal, Rogers says. Most students come to Kellogg expecting to find good jobs after graduation. Most recruiters approach Kellogg hoping to find top-notch hires among the schools ranks. Its the job of the Career Management Center (CMC) to make sure both groups leave the school satisfied. The CMC works intensively with both constituencies to ensure that the recruiting process goes smoothly. That can include everything from videotaping mock interviews, to running job-hunting workshops, to hosting roundtables for employers. Thats on top of coordinating thousands of on-campus job interviews each year. Counselors in the Students Affairs office face a multiplicity of responsibilities. A short list would include planning and hosting CIM Week, handling course registrations, working with student clubs, and overseeing the teacher course evaluation process. But their most important job is to smile when students come into the office and respond to their needs, says Ed Wilson, associate dean for masters degree programs and student affairs. Last years graduating class rewarded the department with a satisfaction rating of 9 out of 10 on the deans annual exit survey. Business Week rated Kellogg No. 1 in student services in its last ranking of U.S. business schools. 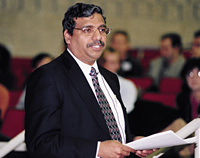 Dean Dipak Jain says Kellogg School staff members are its "unsung heroes." "Even with our top faculty and outstanding students, Kellogg would not be what it is without the efforts and dedication of its staff," Jain says. "Their professionalism and commitment are evident in every department, at every level. I feel very fortunate to work with them on a daily basis." They balance the schools books and help new faculty get settled. They field all general calls to the school and help Dean Dipak Jain manage his packed schedule and many responsibilities. They are Kelloggs central administrative staff, and to them fall many of the tasks necessary to ensure Kelloggs smooth operation each day. Fortunately, the challenge is eased by a strong sense of teamwork and esprit de corps. Carole Cahill, assistant dean and director of administrative services, says that atmosphere is one of the defining characteristics of Kellogg. Staffers at The Managers Program wear many hats. Its no small task. The 10-member staff does everything from sending out applications, to processing them, to making admissions decisions, to handling registration, to working with students to plan a wide range of extracurricular events, to ordering diplomas. How do they get it done, while still maintaining TMPs top-flight reputation? With a willingness to pitch in, no matter how small the job. Lyons himself, for example, rolls up his sleeves at the beginning of each quarter to help change the names on each of the programs 1,300 student mailboxes. We all work together, and when theres something to be done, everyone knows what it takes, Lyons says. Professionals who seek an MBA later in life often face unique pressures. Many juggle demanding jobs and family responsibilities while pursuing their degrees. The nine-member EMP staff aims to ease as many of their concerns as possible. That attitude is reflected in rankings that rate the program No. 1 among executive MBA programs. Kantor credits much of that customer satisfaction to her staffs dedication and longevity. Many have served the program for years. Kelloggs 24-member information technology team may have the broadest scope of any Kellogg department. The group is responsible for information technology for all Kellogg programs and locations  in the Jacobs Center, at the James L. Allen executive education center and at 340 E. Superior in Chicago. The department is on call 24 hours a day, seven days a week. It provides direct support to Kelloggs thousands of students and their laptop computers, and to the schools hundreds of public computers. It also responds to the technology needs of faculty and staff  as well as alumni, recruiters, applicants and corporate contacts who use the schools applications and Web site. To ensure that Kellogg stays on the technological cutting edge, the group relies heavily on input from the people it serves. Department members also work together to share skills and knowledge with each other. If you picked up your newspaper recently and saw an article about the latest innovation at Kellogg, its likely the reporter learned about it from the schools External Relations staff. If you checked the Kellogg Web site or perused this issue of Kellogg World for news about former classmates, you saw the work of the department as well. The 10-member department includes writers, editors, designers and media-relations experts. All acquired extensive experience in their fields before joining Kellogg. They write, edit, design and produce three issues of Kellogg World annually, as well as an additional 150 publications, including applications, brochures and course catalogues. They also design and maintain Kelloggs Web site, and they work with national and international media to generate news coverage for the school. Kellogg could not survive without the generous financial support of its alumni, corporate partners and other friends. Nor could it thrive without the work of its nine-member Development Department, which coordinates all of the schools fund-raising efforts. Many Kellogg alumni are eager to maintain their ties to the school long after graduation. The Kellogg Alumni Relations Department aims to help them do just that  easily and enjoyably. 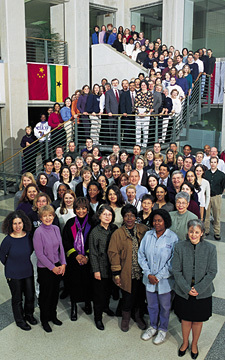 The department is Kelloggs contact point for its more than 40,000 global alumni. Its five staff members not only coordinate Kelloggs annual alumni reunion; they also work with the schools 80 alumni clubs to plan additional gatherings around the world. They also maintain a variety of Web services for alumni, including an on-line directory, a variety of listservs and lifetime e-mail accounts. In addition, they facilitate the work of the schools roughly 180-member Alumni Advisory Board. People come to Kellogg for the academic reputation, Associate Dean Ken Bardach observes, but they come back for the experience. Bardachs staff at the James L. Allen Center aims to make that experience as rewarding as possible for the 5,000 people who attend Kelloggs 120 executive education programs each year. The 35 staffers comprise a full-service shop, says Bardach, director of executive education. They design and market the centers programs, register the participants, and provide the faculty with all they need to deliver a top-quality educational experience. Up to seven programs are under way at the Allen Center at any given time. The staff makes sure each one goes off without a hitch. But those efforts will likely be invisible to the customer. They see only the customization of their program, and how well the experience is operating for them, Bardach says.